The first commemorative Iceland stamps appeared in 1911, celebrating an Icelandic-born Danish statesman and author, whom they consider as being the father of their independence movement. 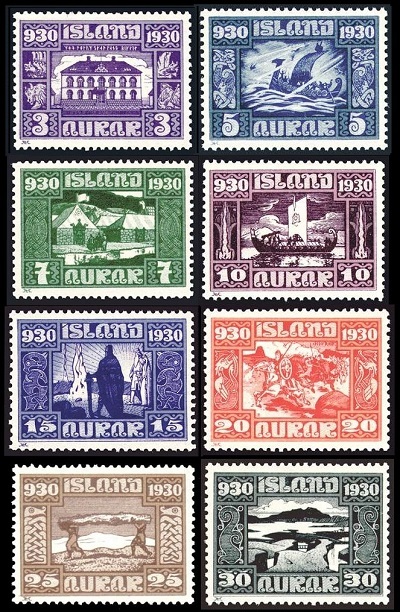 However, Iceland philatelists, to this day, consider the greatest commemorative stamps of this island nation as being the massive millennium sets issued in 1930. 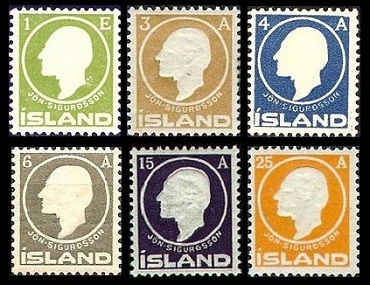 The six commemorative Iceland stamps shown above (Sc. #86-91) were issued during 1911 to celebrate the 100th Anniversary of the Birth of Jon Sigurdsson. These definitive-stamp-sized commemorative stamps are typographed and embossed. Jon Sigurdsson (1811-1879) was born on June 17, 1811 in the West Fjords region of Iceland. In 1833, Jon moved to Denmark to study grammar and history at the University of Copenhagen. He became an expert on Icelandic sagas and Icelandic history, and Icelandic politics began to consume most of his time. His peers, at the time, described him as being a protagonist of modernization, democracy, human rights, and economic progress. Through his efforts, the Kingdom of Denmark granted Iceland a constitution in 1874, giving it limited autonomy in its internal affairs. Today, Jon Sigurdsson is considered the leader of Iceland's 19th Century independence movement, and his birthday is observed as a national holiday. His home in Copenhagen is now property of the Icelandic government and it serves as a cultural center for Icelanders in Denmark. 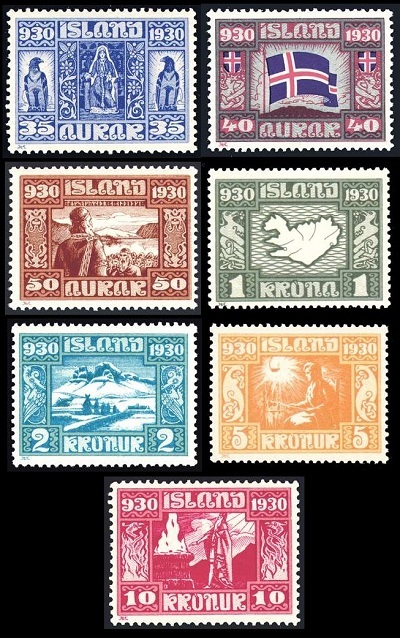 The fifteen impressive looking, pictorial commemorative Iceland stamps shown above were issued on January 1, 1930 to celebrate the 1,000th Anniversary of the Althing or the Icelandic Parliament, one of the oldest parliamentary institutions in the World. 03 A. (Sc. #152) - Parliament House in Reykjavik, built between 1880 and 1881. 05 A. (Sc. #153) - A Viking ship in a storm. 07 A. (Sc. #154) - Parliament Meeting Place in 1690. 10 A. (Sc. #155) - A Viking funeral. 15 A. (Sc. #156) - Vikings claiming the island. 20 A. (Sc. #157) -The Dash for Thing. 25 A. (Sc. #158) - Gathering wood. 30 A. (Sc. #159) - Thingvallavatn Lake. The Althing was founded there in 930, and the Althing held its sessions there until 1799. 35 A. (Sc. #160) - Icelandic woman in a national costume. 40 A. (Sc. #161) - The Flag of Iceland. 50 A. (Sc. #162) - The first Althing in 930. 01 K. (Sc. #163) - Map of Iceland. 02 K. (Sc. #164) - A Winter-bound home. 05 K. (Sc. #165) - Woman spinning. 10 K. (Sc. #166) - A Viking sacrificing to Thor. These fifteen commemorative stamps were also overprinted "þjonustumerki" in red or blue, for use as Official Stamps (Sc. #O53-O67). Additionally, five commemorative airmail stamps (Sc. #C4-C8) were also issued for the millennium celebration. The four commemorative Iceland stamps shown above (Sc. #195-198) were issued on November 11, 1935 to celebrate the 100th Anniversary of the Birth of Matthias Jochumsson. The common design features the left-facing portrait of Matthias Jochumsson (1835-1920), the Icelandic poet, playwright, and translator. He is the author of Lofsöngur, the national anthem of Iceland. The 35 A. denomination commemorative Matthias Jochumsson stamp shown above, at the left, was overprinted and revalued to a 5 A. postage stamp (Sc. #212) on March 17, 1939. The 3 A. denomination commemorative Matthias Jochumsson stamp shown above, at the right, was overprinted and revalued to a 25 A. postage stamp (Sc. #236) on March 6, 1941. The three commemorative Iceland stamps shown above (Sc. #199-201) were issued on May 14, 1937 to celebrate the 25th Anniversary of the Reign of King Christian X of Denmark. The common design features the left-facing portrait of King Christian X (Lived: 1870-1947, Reigned: 1912-1947).